Trips on a Bike - Page 2 of 5 - Bicycle touring is awesome. This is a record of trips I've taken. 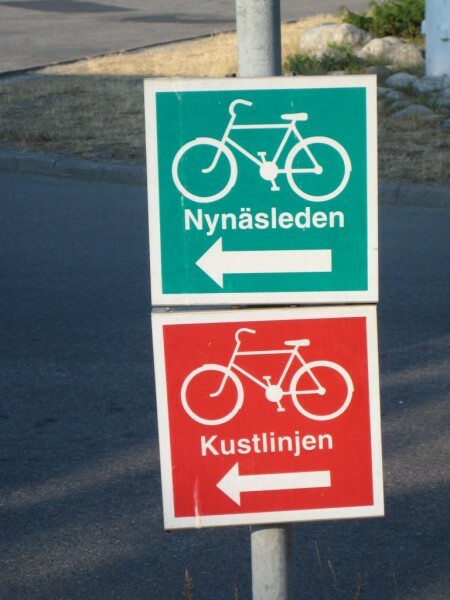 There’s a bike path called the Nynasleden that goes the entire distance between Stockholm and Nynäshamn. It’s a reasonably short ride from the Stockholm ferry terminal to central station, and the bike path starts near the station. It’s about an 80km route, with some of that on off road bike path. The route is also one of the best sign posted bike routes I’ve seen. We got confused a couple of times, but were on track within a few minutes each time. At the time of writing there’s an excellent map available on OSM cycle maps. I’m not sure if it follows the Nynasleden exactly, but I’m not sure we did either. Sweden was going through something of a heatwave, and I hadn’t ridden a bike in a few weeks so found this day pretty hard. It’s a little hilly. A fair amount of up and down, but no long climbs at all. After Stockholm the path only passes through small villages. There aren’t that many opportunities to stop for food or water, but enough to make it comfortable. If you want to stop for a swim there are a few lakes that looked very tempting. There was a camping ground in Nynäshamn where we stayed the night. It’s reasonably priced at about 150 SEK. We had to get a Camping Scandinavia card for 130 SEK, but they provided that at the checkin and once we had it we didn’t need to worry about it again. I’ve read a few websites recommending getting a Camping Scandinavia card before the trip, but I wouldn’t bother. 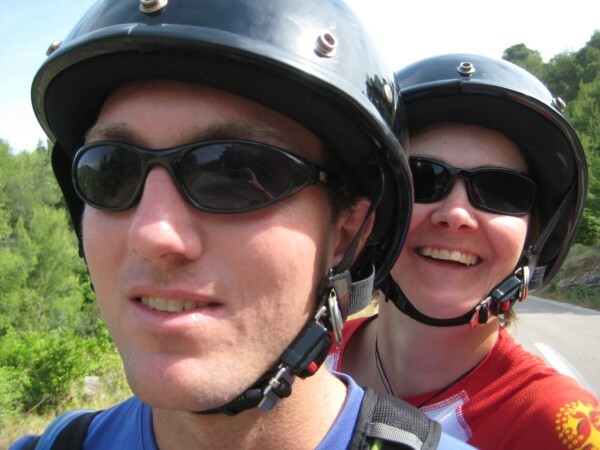 We planned this Easter weekend ride with our friends Bel and Dan in 2010. From Sydney we caught the train to Windsor and left about midday towards the Sackville ferry. 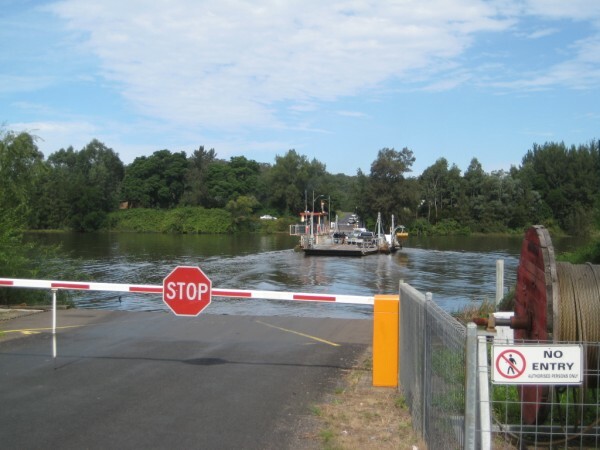 Not long after the ferry we turned left onto River Road which followed the Hawkesbury until Wiseman’s Ferry. It’s a nice ride (as most riverside routes are); undulating but no daunting climbs. There’s a lot of waterskiing in this part of the river, and the riverside is dotted with caravan parks if you want to camp anywhere along there. A man who was chatting to us over his front fence recommended we go to Del Rio, which is a “riverside resort” with camping and a bar, not far over the river from the Webbs Creek ferry. It wasn’t the most peaceful location, but it did have hot showers and a bar. We were cooking our own, but the bar also did food. I wouldn’t really recommend it if you are looking for something peaceful. In the morning we went back over the river on the Webbs Creek ferry, then again on Wiseman’s ferry. Wiseman’s Ferry Road follows the river downstream for a while until Spencer where we had lunch. Then it leaves the river and heads up Mangrove Creek. This is an OK ride until the road leaves the creek and heads up towards Mangrove Mountain. There are a few kilometres of a constant hard climb before it settles into a bit of an easier climb. Check the elevation profile at the top of the post from about 95km – it’s steep. Even though the distance covered was short for a day of riding it did take us most of the day, although we regularly stopping for coffee breaks and the like in the morning. There’s a shop at Mangrove Mountain where we bought a drink and some water and asked about camping. There are no caravan parks or campsites around, but she recommended the football field which was a short ride up the road. This turned out to be ideal – nice grass to pitch on, quiet, and fairly secluded. After a good meal, some wine, and some very tasty scotch supplied by Dan we slept well. We had camped quite close to the top of the hill. It’s about 4km to Central Mangrove, then almost all downhill from there for the rest of the way. We stopped at Peats Ridge for delicious hot crossed buns and a bad chai latte, then enjoyed a quick downhill run (some of it quite fun) to the Pacific Highway and on down to Brooklyn. At Brooklyn we had a couple of celebratory beers and fish and chips for lunch, before catching the train home. 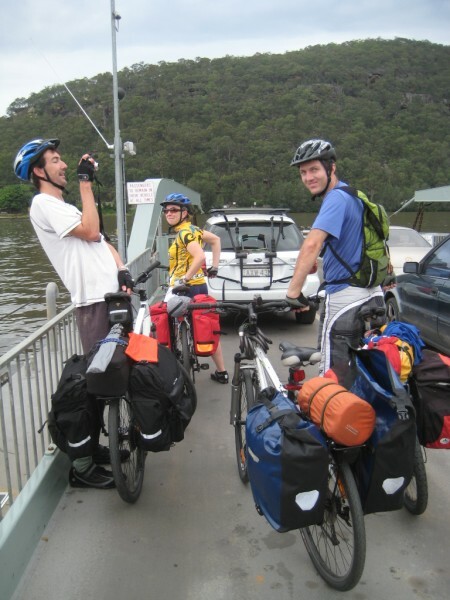 The route we took for this ride came from http://www.cycleaustralia.info/cycling/hawkesbury.htm. It also marks a side trip to St Albans, which would probably be worth it. There’s an excellent pub there. Even though there were shops along the route we took most of our food with us as it was Easter, but there wasn’t really a need as most shops seemed to be open even on Good Friday and Easter Sunday. I would recommend carrying a fair bit of water. We had no problems refilling in cafes generally, but at Mangrove Mountain (at the top of a long climb) the only water to be found was bought at the shop. For camping, there are a plethora of caravan parks along the Hawkesbury, but after that not much. There is the Mill Creek campsite in Dharug National Park which is nice, but I would recommend the football field we used at Mangrove Mountain, as Mill Creek is a few kilometres off the route. The football field is on a side road, but signposted from the main road. Other than that there are probably a heap of places you can free camp in Ourimbah State Forest and the like. It was quite scenic for nearly the entire way. Where we weren’t following the river we were either too busy climbing to notice anything, or going through state forest or national parks. There were some great views from the Pacific Highway. With an early start and a late finish you could easily do this as a two day trip. The traffic in Croatia was not as bike friendly as in Slovenia, and our couple of rides along the busy coastal road weren’t particularly pleasant. This basically limited us to travelling the islands. That’s OK, as Croatia has fantastic islands. It’s generally easy to travel by ferry between islands, but for some reason you can only take bikes on car ferries and not the people-only catamarans, and this limited our movements considerably. Ferries can also be quite expensive for bikes. The heat was often a bit too much to ride in, so opting to spend four or so hours in the middle of the day lazing about in the shade somewhere, and only riding morning and late afternoon was great. The time off can easily be wasted on delicious gelato, beer, and enjoying the seaside towns. 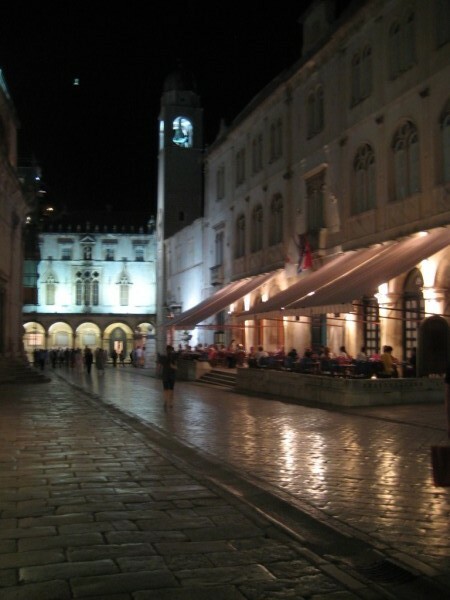 Krk as a town was a highlight – beautiful, but small and relatively quiet. 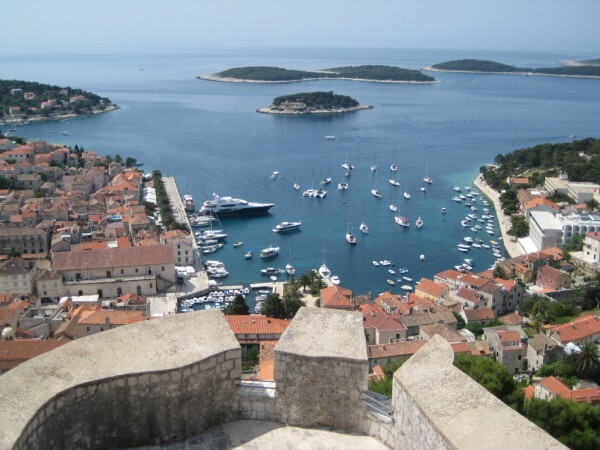 For cycling the highlight was probably the twin islands of Cres and Losinj. Although the big cities are great in themselves, as a cyclist it’s difficult to like them. 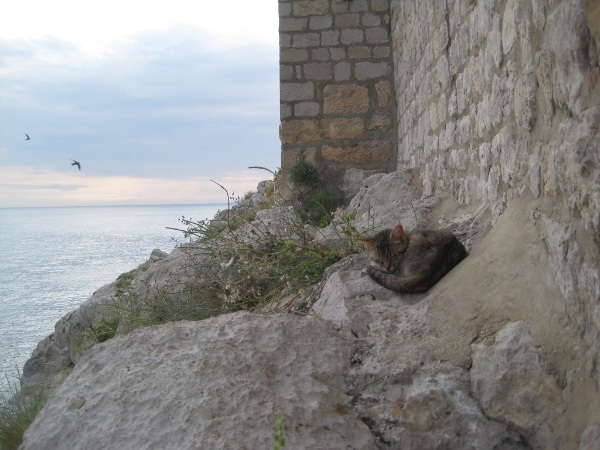 Dubrovnik in particular is a very beautiful city, but is more suited to the normal tourist than cyclists. 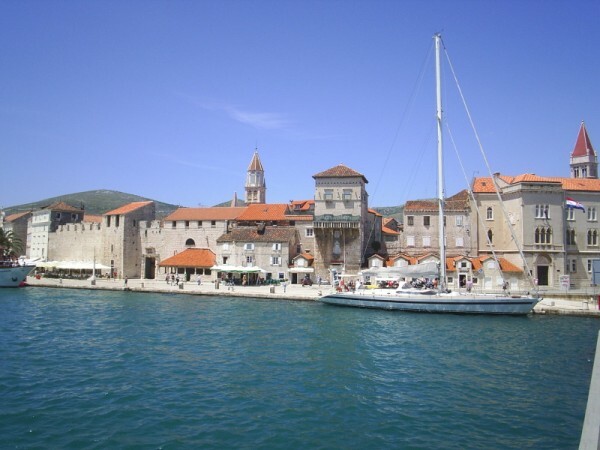 On another cycling trip I would gladly skip the big cities and spend the entire time on the islands, then visit Montenegro via Trebinje. The inland route via Bosnia seems it would be much more pleasant and easy than the coastal road. Finding campgrounds in Croatia was easier than in Slovenia, but they were usually rocky and hard ground, and we came home with a few bent pegs. In some cases we used rocks more than pegs to anchor the tent. We didn’t cycle as much distance as we intended. In Slovenia we were limited mostly by bad weather, and in Croatia it was our limited ferry options and our unwillingness to ride the main coastal highway, and the heat. What we did was very enjoyable though. We also improved quite a lot as cyclists over the three weeks, and were in pretty good shape by the end. Apart from the unusually high rainfall we suffered, Slovenia was a better country for cycling. It’s less touristy and more bike friendly than Croatia, and there were areas that sound great for cycling that we didn’t visit, such as the Krka river. Anyway, it was a great trip. I think our only mistake was to try to fit in too many places which were far apart, meaning we had to cover quite a lot of distance on other forms of transport in order to fit them in. Catching trains, buses and planes is so much less fun and rewarding than cycling, and considerably more expensive. It would be better to cover less distance and be cycling nearly all of the time, even if it means missing a lot of the big drawcards of a region. There are so many small things which will make up for it. Our last day in Dubrovnik before heading home was spent looking for bike boxes. As there are a total of zero specialist bike shops in the city and a similar number of helpful people in the sports shops that did sell bikes, this turned out to be not possible. Estonian Air’s policy is that all bikes must be in a box. When we called them they said they would accept them bagged, just not take responsibility for any damage. Eventually we found some huge sheets of plastic from a gardening shop to wrap them up in. This is far easier and more practical than a box anyway, as it made packing the bikes a simple task, and we could fold them away for reuse later. After this experience I would definitely recommend bagging rather than boxing. Just take off the wheels, turn the handlebars, and remove the pedals, just as you would if packing in a box. Bike are relatively sturdy and are likely to survive the trip, even with baggage handlers roughing them up a bit. We had a mid morning flight back to Tallinn, and there our trip ended. We took a day off from our lazing about in Dubrovnik to make a side trip to nearby Trebinje in Bosnia. Since it was just a day trip we didn’t have much weight so it was to be a relatively easy ride. Leaving Dubrovnik wasn’t so easy because it was quite a long steep hill, and a very busy road. There was a shoulder which made it, although still a little frightening, at least managable. About 4km out of Dubrovnik we turned off the main highway onto a small road which led to Trebinje. At first we thought we were lost because the road was completely empty, and we thought it was a major road into a different country and so should be busy. There were a couple of quarries around but little else. We were able to confirm we were on the right track though and continued on our merry way up the winding road. The views back to Croatia and the Adriatic were quite spectacular. View from the pass over the mountains between Dubrovnik and Trebinje, near the Croatia/Bosnia border. Because of the history of unfriendliness between Croatia and Bosnia I was expecting the border security to be quite tough, but it was the most relaxed I’ve ever seen. The Croatian border waved us out, then when we got to the Bosnian security I was taking too long to find Millerine’s passport, so they sent us through without checking. Obviously two non-slavs on bicycles don’t pose much of a threat. The rest of the trip to Trebinje was uneventful. 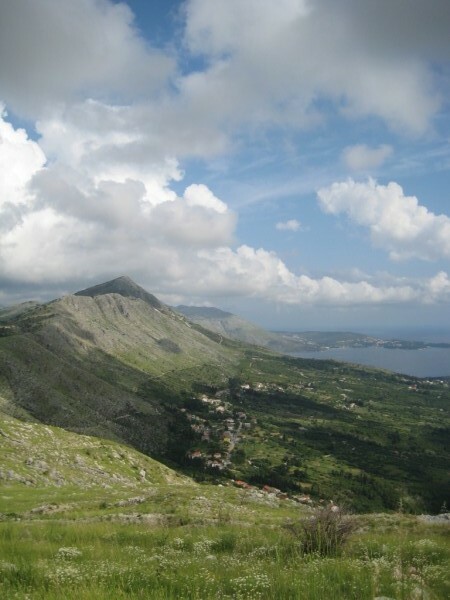 The road continued winding up to the top of the hill, then it was a gradually graded 15km ride down into Trebinje. In between there was very little other than abandoned and destroyed buildings, road kill, and only about four or five cars. It was very stark. It looked as though it had been hit hard by the war and never recovered. The view of Bosnia was nothing but mountains. If I were to ride to Montenegro I would go via Bosnia though. It’s a much more pleasant ride than along the busy coastal road. Trebinje was a very normal city, not a beautiful town like we were getting used to. There was an old town, but not much of one. It had other things going for it though. We were the only tourists in town, it was very cheap, and everyone we met was helpful and friendly. I got out fifty konvertibilnih maraka (the very interestingly named currency) after judging its spending power by looking at cafe beer prices, but it went a very long way. We went to the markets and bought a whole heap of vegetables, then had what for us was a gourmet restaurant lunch (the best food for the trip), and still had enough to buy some food and alcohol supplies for a couple of days. In general there wasn’t much to see, but after being in overtouristy, unfriendly Croatia for so long the friendliness of the people of Trebinje was very welcome. On the way back the border security just waved us through. We enjoyed more of the view of the Adriatic, and were back in time to cook a delicious vegetable soup from the produce we had picked up at the markets in Trebinje. We left the campground early as we were obliged to do, and spent a while riding around Zadar. It’s a nice town with a bustling lifestyle, and seems to have a life of its own apart from the tourism. We saw some roman columns and some markets before leaving. It seemed a nice enough town to stay in for a couple of days. We caught a bus from Zadar to Trogir near Split as we wanted to avoid the busy mainland coastal road. It is up to the driver of each bus service to decide if they’ll take a bike, and they seem generally reluctant to do so. There is a train but it takes a long time with multiple changes and the services are apparently not particularly reliable. The bus drivers are difficult to communicate with, making the process of getting a bike on a bus a pain in the arse, and it’s also more expensive than trains. Avoid taking bikes on the bus in Croatia if you can, although I would also be reluctant to ride the coastal road. We would have fared better if we had been more prepared with better maps and details of all the possible ferry routes. Trogir is a lovely small town that we stayed in for two nights. It has a small walled old town with a small fortress, and many, many scooters. We camped a few kilometres away from the old town on an island you could access by bridge. The ground was ridiculously hard and I bent the pegs trying to put them in. There were a few beaches which were recommended to us by the tourist info, but they were uninspiring gravel beaches. The next day we caught the bus to Split for a day trip. It has a beautiful roman palace in the centre, but apart from that felt like quite a soulless city. We met an English man doing an England to New Zealand trip who looked set for life. His Burley Nomad trailer was piled up with gear, and was quite colourful with flags from places he’d been to. He claimed to get quite a bit of attention when on the road. Not sure I’d want to pull that weight though. Also he used foot straps rather than cleats, which is unusual for a long distance cyclist.